I feel robbed that I did not get the opportunity to ask my Great Uncle Burl what it was like to train in North Africa or share stories of being at the Duomo in Florence. I was a young teen when he passed, and he did not share the horrors he saw as part of the 316th Medical Battalion in the liberation of Italy. Then as an adult, I received the precious gift of his scrapbooks, which have given me a little insight. 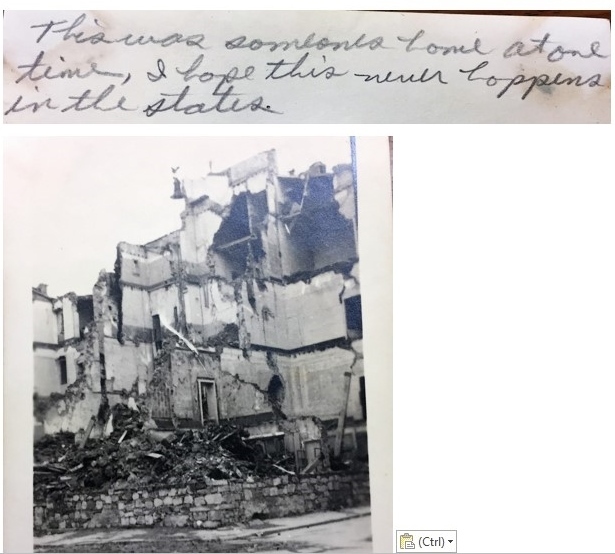 One particular annotation on the back of a photo caught my eye. Among images of young men in uniform going from the desert to mountains and snow, there was one of a destroyed building. On the back Uncle Burl wrote, “This was someone’s home at one time, I hope this never happens in the states.” I feel this description is timeless. No matter what is going on in the world humans make decisions on whether to take action or not, but we always hope the bad does not find its way to our homes and family. Burl was lucky and made it back to marry his love Phyllis, and be a second grandfather to me. As humans, we naturally feel connected to those with the same blood and Burl and Phyllis were even closer than “regular” aunts and uncles. Burl was my grandfather’s brother and Phyllis my grandmother’s sister. When they both developed Alzheimer’s and eventually passed away it was of course upsetting, but in addition to the loss of family I lost the opportunity to understand their history. I was just in high school developing my love of the humanities, and I had so many questions about Burl's experiences in WWII. Then my mother handed me his scrapbooks. Humans often look for a connection to not only their families history, but how their families connected to the history of the world. This was that moment for me. Humanities Moments is a project of the National Humanities Center.